If you are the facilities manager or caretaker at a nursing or care home then you’ll know how important it is to have adequate access control onsite. Security is important, not just to ensure resident and staff safety, but also so that property and valuable equipment is protected. Nursing and care homes are often busy places, with many people coming and going all day long, especially during visiting hours. Balancing the need for access control, while maintaining a relaxed environment for residents can be tricky. The last thing you want to do is make the home feel like a fortress, but restricting the movement of people inside the home is an essential part of site security. In this blog post we’ll look at the best way to restrict and control access inside nursing and care homes, and how this can be achieved on a tight budget. Access control products act as a “red light” and help to deter unauthorised entry in areas that need to be kept off limits. Products today range from technologies that combine ID cards with entry systems, right through to good old-fashioned locks and keys. Before purchasing any system or product, you’ll need to consider how much budget is available, what the products will cost, how much disruption the installation will cause and how easy the product will be to use and maintain on an on-going basis. Card entry systems offer plenty of control and sophisticated audit trail features. The systems are, however, expensive to install, as they have to be ‘wired in’ to provide both power and communications to each door; retrofitting wired access in any building is disruptive and expensive. Traditional key-operated locks do offer good levels of security, but only when the keys can be properly managed. Key management becomes more problematic as the number of key holders increases, as it would in large homes with lots of doors. Every time a key is lost the lock (and keys) should be replaced in order to maintain security. Although the use of key-operated locks may seem to be the obvious solution to controlling access, managing multiple key holders who have access to multiple locks can quickly get out of hand. That’s why more and more facilities managers and caretakers are choosing to replace locks and keys with a more convenient and modern method of door entry. A keyless digital door lock is a standalone access control product that offers greater functionality over traditional locks and keys. Access through the door is achieved by keying in a code on the keypad. If you don’t have the code, you can’t get through the door. The locks can be used as primary locks on most doors, including wood, aluminium and even glass. Codes are issued to appropriate members of staff for entry to rooms or areas within the care home where access needs to be controlled, for example, in areas where medicines are stored or where patient data is kept. If a staff member leaves, the code can be reset and issued again. Making regular access code changes will ensure a digital door lock remains effective and help deter codes from being misused or passed on. Where access to certain areas may be time sensitive, keyless entry locks offer a ‘code free’ mode – this might be useful, for example, in the main lounge area. A member of staff can open the door in the morning, by entering a code and then put the lock into code free mode so that care home residents and visitors can come and go during the day. At the end of the day, access to the lounge can once again be restricted. It’s not just doors that can be secured using push button locks. Digital locks are also available for lockers and cabinets as a replacement for traditional key cam locks. The locks work in exactly the same way; using a code to unlock the locker or cabinet, rather than a key. The main advantage here is that the user does not have to carry a key around with them. This might be useful for staff to keep their belongings safe while they are working, or for cabinets containing medicine in a nursing home, which could be harmful in the wrong hands. 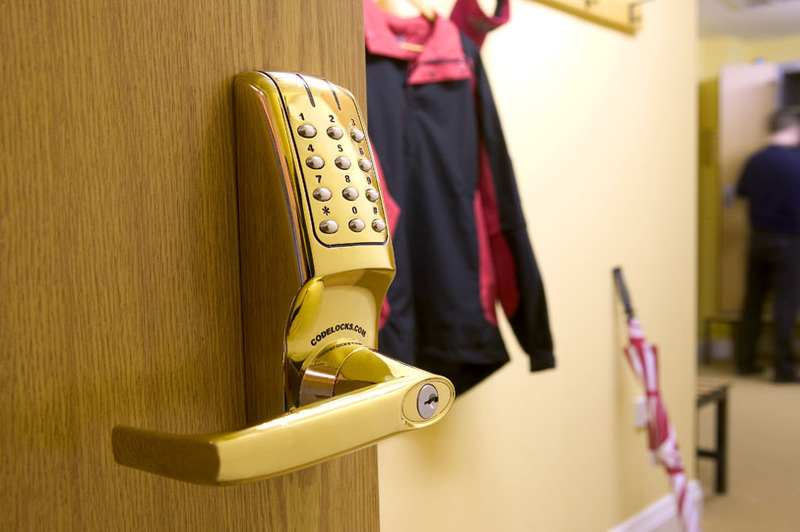 There are many applications within nursing and care homes where digital keypad locks can provide a cost-effective and manageable level of access control, without the hassle of using keys. You may also want to consider the catering areas, cupboards containing linen or cleaning equipment, first aid cabinets, administrative offices and staff rooms. To see our full range of coded door locks please visit our website. If you have an application you’d like to discuss, our technical support team is on hand to help just call 0800 393405.